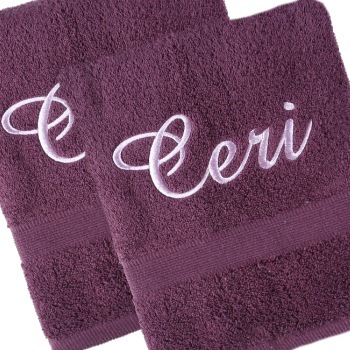 A pair of his and hers matching Cotton bath towels in rich aubergine purple colour. Superb gift for couples and newlyweds. Superb gift for couples and newlyweds. Popular for wedding or anniversary gifts and honeymoon gifts. These 75 x125cm bath sized towels are soft plush Cotton. Personalised with your choice of embroidered text such as His and His, Hers and Hers, Yours and Mine, Mr and Mrs, or the couples names or initials monogrammed on each.